When you work hard for your company every day, you deserve a retreat in the fresh alpine air and beautiful lakeside setting of Truckee and North Lake Tahoe. Treat your employees to a corporate retreat in Truckee, where the serene mountain atmosphere promotes clear-headed thinking and a sense of relaxation. Take the first step to planning your next corporate retreat by finding the best place to stay. Browse through our exquisite selection of Truckee CA Vacation Rentals down below! Whether you’re interested in renting out adjacent cabins or an enormous house or two for employees to share together, our rentals are the best vacation rentals in Truckee CA because they have your needs covered. Step inside of these fresh, modern cabin-like homes, which couple sleek design with woodsy details of knotty pine, traditional fireplaces, wooden and leather furnishings, and alpine décor. The floor plans in our properties are spacious and open, ensuring that your guests have all of the space and privacy they need during your corporate retreat. Gather together in the living room during the downtime in between motivational pep talks and team building activities, laying back on comfy designer furniture and enjoying the warmth of the fire while watching a movie or show on the flat screen television. Or, if you’d rather have unplugged relaxation, enjoy features such as private and community pools, hot tubs, saunas, recreation centers, gyms, and golf courses. 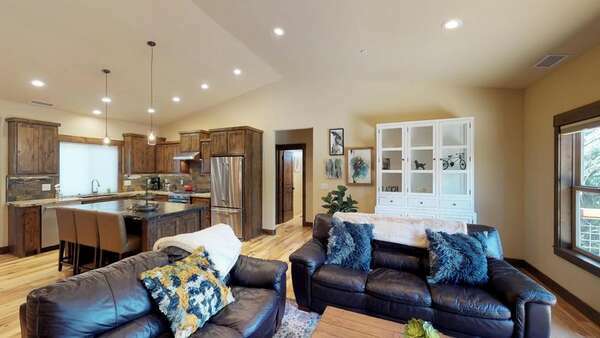 Use the enormous kitchens in our Truckee CA Vacation Rentals, outfitted with top-tier appliances and generously proportioned countertops, to cook a feast together, prepare catered food, or reheat leftovers from one of the mouthwatering local restaurants in Truckee nearby. Enjoy your meal at the dining table, bar seating, or breakfast nook indoors, or out on the deck for a lovely alpine al fresco dining experience. After a long day of bonding with colleagues, you and your employees can use the resort-caliber restrooms in these properties to treat yourselves to a hot shower or a soak in the tub. When you’ve washed up, retreat to the sumptuous comfort of your soft bed, slipping between silky sheets for a wonderful night’s sleep and waking refreshed for the next day’s events. Group sports of any kind help build that bond that you look for in your successful team. And Lake Tahoe is full of such activities that are both competitive and fun at the same time. Water sports offer a great way to spend the day enjoying a safe activity or two. You can try jet skis, parasailing, water ski, the Ski-Doo GTS 300, wakeboarding, wake surfing, and wakeskating. Lessons are also provided and are not limited to beginners. Those who have some level of skill in the sport can still improve with the intermediate or advanced lessons offered. Water skiing, in particular, is a great way to bring everybody together since group lessons are offered. There’s nothing like sharing in a fun activity to create a good vibe within the team. Chartered trips across the lake are another way to enjoy the scenic views around here. Both hiking and biking are very popular sports around North Lake Tahoe. The network of trails stretches for miles and miles, cutting through woodland, climbing up mountains, and slithering toward the beach. Paige Meadows is a great hiking area both during the summer and winter months. Mountain biking is good when the weather is warm, while cross country skiing is the perfect sport to enjoy when the snow blankets the mountains. The trails will take you to the top of some hills which offer superb views of the whole landscape. The local fauna and flora also make hiking the trails a rewarding experience. Keep your eyes open for sightings of local wildlife and also have your camera ready. Bird lovers will want to aim for the trees as they walk down the trails. Depending on the season, several species of birds nestle in these woods. Learning any new skill can be difficult, but when done in a group it can get easier. This applies to work and fun activities in equal measure. One way to help a group of people blend in together and create cohesion and harmony among them is to engage them in a fun activity like learning to dance. Tahoe has many dance schools which specialize in different dancing steps, from salsa and ballet to tap and modern dance. Get everyone to follow the rhythm and express their creative side by taking dancing lessons. Enroll in a summer camp, a workshop, or a special event for a fun and memorable experience during your stay in one of our Truckee CA vacation rentals. Contact our team of reservation specialists today to learn more about the best vacation rentals in Truckee CA and the wonderful activities in town!